I have recently found myself updating my resume. Why? After 4 1/2 years at Spigit, I have moved on as the company has been acquired by Mindjet. It was a good run there. So I needed to dust off the resume. And you know, it was eye-opening how limiting resumes are. They are great for their core job-to-be-done: provide a history of your work. But they’re terrible if you want to go into more depth. You see advice to limit resumes to two pages. Use “power” verbs. Avoid graphics that foul up automatic scanners. Good counsel, but not what I want. I wanted to communicate a narrative about my work at Spigit. We spend so much time in our jobs, and there is always a story there. It’s richer than anything you can communicate via a series of bullets about your skills. I want to describe the circumstances of the work. Give some key milestones of my employment. Describe the projects and outcomes of my work. 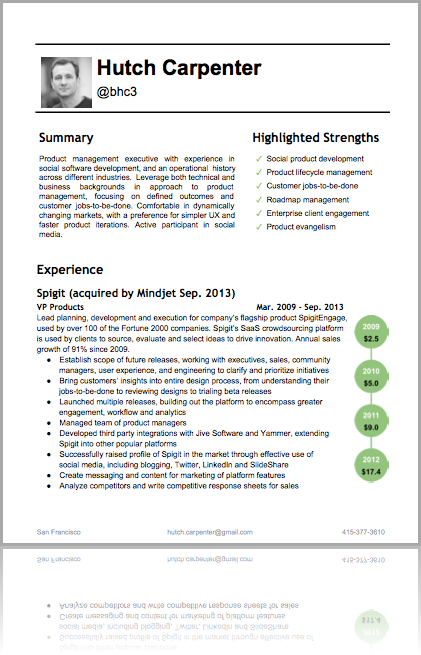 Creative types will augment resumes with portfolios. What about the rest of us? I exported the Google Drawing to PDF. To turn the PDF into a high resolution PNG file, I followed the advice on this StackExchange post. The final question is where to put the infographic. It doesn’t exactly fit a standard letter (U.S.) or A4 size, so you can’t append it to your resume. So I’ve uploaded it to Slideshare and Scribd, added it to my LinkedIn profile, and it graces the About Me page of this blog. Would be kind of daring to send it to a prospective employer, eh? If you’re interested in creating one of these, feel free to contact me. I can offer you what I learned in making it. And in case you’re wondering, Spigit’s revenues are publicly available via SEC filings by its lead investor PICO Holdings. This is great, Hutch.You might want to throw it up on Pinterest as well. Maybe a lot of folks will repin it. 🙂 I started a visual resume some time ago, but it didn’t dawn on me at the time to represent one position; instead, I tried to encompass a little over forty years and my thinking was obviously constrained by my generational position, as I envisioned it being printed on a piece of paper. This is much better and I’m excited . . . for you and for what others can gain from this. Thanks for sharing. (2) Examples of how you’ve productively combined/used these skills to create competitive advantage and examples of how much (and/or how cost effectively) you were able to create it. It is possible (perhaps even probable) that conventionalists will not only not look askew at the infographic but may even hold the attempt to use it in this way against you. (No one said that these folks might be expected to ever become brain surgeons.) So the resume has to carry the weight and the infographic simply repeats certain parts that can be more comprehensively reviewed (at the reader’s discretion) in a more intuitive rather than formal manner. Re the infographic as it stands, unless you were a principal at Spigit, using it as a proxy for your own achievement may be viewed as obfuscating and possibly even redundant. Once again, in the resume you’ll want/need to either explain how the application of your unique talents (or the unique way you applied them) created greater competitive advantage than would have otherwise been the case. A short pertinent testimonial connected to each pertinent graphical rendition in the inforgraphic might be one way to use the it to convey credibility and detail (once again, at the reader’s discretion) – and I’m sure that with some thought you can arrive at several more ways as well. Good Luck (although I don’t expect you’ll need as much as others of us might). I look forward to hearing (reading) positive results in short order. Thank you Rick. Was a bit leery of sharing this, but thought it would be something different people could try. Resumes aren’t going away just yet, although they may become your LinkedIn profile more and more.A history of what one has done is still needed, and not everyone can point to a portfolio of designs, art, writing, music, etc. as examples of work product. I definitely view this as augmenting the resume, not replacing it. I had a chance to meet with a couple recruiters, and I showed them this. They like it, because it offered details about my work at Spigit beyond what I have on the resume. Specifically, the actual products I worked on and the customers I worked with. But they expressed a similar observation. This would come in *after* someone has reviewed my resume and wants to learn more. There is one benefit of this approach too. In the realm of social media, people are not going to bother with reading a CV too much. But if you have an engaging way to tell your story, you will gain some awareness that you would otherwise not have. Potentially, something results out of that. As always, thanks for your take here Rick. Very much appreciated.